A tank has a capacity of 10 gallons. When it is full, it contains 15% alcohol. 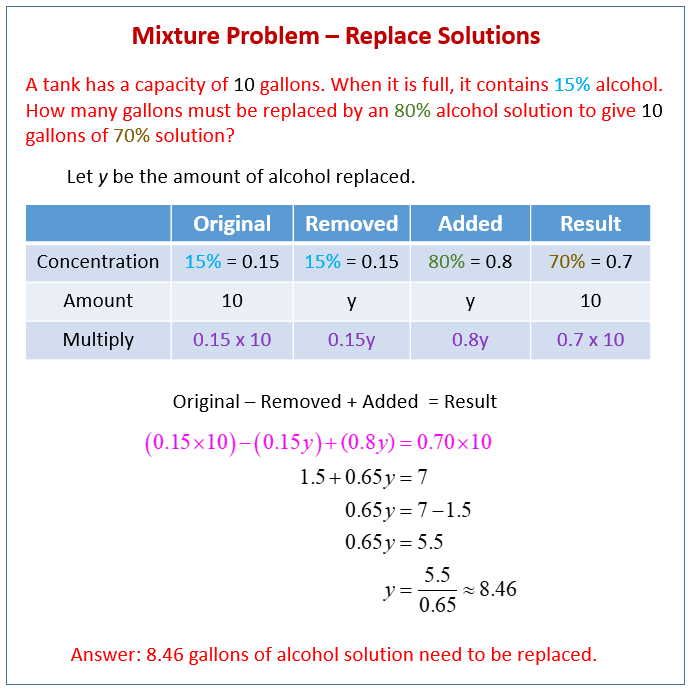 How many gallons must be replaced by an 80% alcohol solution to give 10 gallons of 70% solution? Set up a table for alcohol. The alcohol is replaced i.e. removed and added. Solving a Mixture Problem using a system of equations. We set up and solve a mixture problem using a system of equations with two variables. Before solving the problem, a short introduction to what a -solution- with talking about a chemical mixture. Example: A chemist mixes a 12% acid solution with a 20% acid solution to make 300 milliliters of an 18% acid solution. How many milliliters of each solution does the chemist use? Example: A grocer sells peanuts for $3.00 per pound and a mix of fancy nuts for $5.60 per pound, he wants to make a 20lbs of a new mix that will sell for $4.00 per pound. How many of each does he need?